While I was away, Steven Whitaker resigned as Senior Master of the Senior Courts in the Queen’s Bench Division. Steven Whitaker’s skill lay in making procedure the servant of justice; the prevailing orthodoxy is that procedure is an end in itself, with individual justice in individual cases subordinated to efficiency at all costs. Steven Whitaker has many friends and supporters amongst those who are interested in justice as it is defined in the overriding objective. For some of us, that interest is primarily a professional one – in the context of case management generally, of electronic disclosure specifically, and of cross-border discovery, each of which he influenced for good. For many others his actions had a direct personal effect, principally the victims of mesothelioma, whose group litigation he managed firmly with an eye to the urgency appropriate to the circumstances and for which he won praise in Lord Justice Jackson’s report. He is also a good bloke, that highest of understated English compliments. Before I turn to my own tribute, see some of the comments which turned up on Twitter as the news of his departure broke. I first came across him, in a formal how-do-you-do way, at a London conference in about 2007. His subject there was the obligations of the parties and judges under the rules, and specifically the then Practice Direction 31. In 2005 some obligations about electronic disclosure were shoehorned into the existing PD as paragraph 2A – the first recognition in the CPR that electronic documents needed special attention. There was nothing wrong with the drafting, but hiding the eDisclosure elements away like that meant that the provisions were ignored by lawyers and judges alike. They were treated as optional because almost no judge wanted to touch the subject, and there was a subliminal conspiracy which meant that nobody raised it – after all, if the judge is not interested, which lawyer is likely to provoke judicial interference? The result was retrospective disputes, notably Digicel v Cable & Wireless which might have been headed off by proper case management. It was Master Whitaker’s mission to bring the rules out of the shade and draw attention not only to the obligations imposed by the rules and the professional duties which they brought, but also to the benefits for the parties and for the litigation, if eDiclosure was properly managed. One of the difficulties we faced back then in trying to draw attention both to the obligations in the rules and benefits of complying with them, was the shortage of judges willing to come out and talk about them. At this stage, Steven Whitaker was the only judge who was willing to do this. I remember an invitation to another judge to speak at an eDisclosure conference. He declined, saying that he had been to one before, and it was full of US judges lecturing about discovery under the Federal Rules of Civil Procedure. He entirely missed the point that we had to call on US judges because we could find nobody from the UK judiciary to talk about the subject. Then as now (and as Lord Justice Jackson later identified) eDisclosure was a significant component of the cost of litigation, yet no judge apart from Steven Whitaker was willing to talk about it. I next came across Steven Whitaker when an email arrived from him inviting me to join his working party to draft a proposed Electronic Documents Questionnaire which the senior judiciary had asked him to produce. Would I attend a meeting that afternoon in the Queen’s Bench Masters’ Library? There was barely time to change into a suit get the train up to London, but the opportunity to be involved in this development was too good to miss, so I ran for it. I had cut my procedural teeth in front of the QB Masters in the 1980s. They lurked in a long, gloomy, high-ceilinged corridor, angry men, as it seemed to us then, whose primary interest in life was throwing the book (sometimes literally) at those whose misfortune it was to appear before them. This cartoon from those days sums up the times. I had not been down that corridor for more than 20 years; stepping into it brought back all the nervousness I had felt as a young solicitor. The only thing I remember from that first meeting is that Steven Whitaker and I almost immediately fell into an argument as to the relative significance of a Rule and a Practice Direction. My argument was that since you could be struck out equally for breach of the one as for the other, the practical distinction meant little. His contrary argument was, of course, technically correct – he is, after all, a former member of the Civil Procedure Rule Committee and consultant editor to various Rules publications. Over the ensuing months, a small group of us met to thrash out the details of the EDQ. We had barely finished it before Steven Whitaker was asked to move straight on to a new practice direction which would remedy the defects of the original PD 31 and bring it out into the daylight, whilst also acting as a formal vehicle for the EDQ. More months of drafting followed, usually late at night. One could not but be impressed by the dedication of a judge who gave so much time to this, as well as to the skill and knowledge (to say nothing of the bonhomie) needed to steer a committee through this kind of exercise. In parallel with that, I appeared on platforms with Steven Whitaker in many different jurisdictions – in the US, in Singapore, and Australia, in Hong Kong and in Germany as well as in England and Wales. 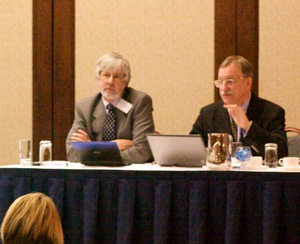 The subjects were either the management of electronic disclosure or cross-border discovery – the Senior Master is responsible for applications for evidence under the Hague Convention, and Steven Whitaker was eloquent about the proper way to conduct such applications in the face of strong US scepticism about the efficacy of the Hague Convention. I remember in particular a speech which he made in Singapore at a most impressive judicial conference organised by the Singapore judiciary. Stephen Whitaker said that he was proud of the connections between England Wales and Singapore. For as long as he was Senior Master, he said, that connection would continue and be important. He was active in offering advice to Hong Kong and to New Zealand, both of which were looking to the UK as a model for case management experience. He thought that was important. So do I. As I said above, some of the tweets referred specifically to Steven Whitaker’s work in managing cases relating to mesothelioma claims. These were benefits of efficiency, but they were also benefits of Justice. We seem to have thrown all that away now. Mitchell and its aftermath has brought a flood of applications which clog the courts. From the judgments I have read and the anecdotal information which comes my way daily, it is clear that many case managing judges have not understood that managing cases involves more than punishing parties for missing deadlines. Their duty is “active management”. Steven Whitaker was one of the few judges who actually understood what this means. Steven Whitaker made his mark also in his judicial capacity. His judgment in Goodale v The Ministry of Justice stands alone as a model for pre-emptive case management by a judge whose focus was on what really matters. Most judgments are about the punishment, or not, of those alleged to have failed in their disclosure duties; it is much more useful to get a judicial oar in before the work is done. Lord Justice Jackson’s new Rule 31.5 CPR now requires a case-managing judge to make decisions about the scope of disclosure and about how it is to be done. Steven Whitaker was there a long time ago. Goodale is also a landmark in that it shows a judge who actually understood technology giving his view as to its use. There are few other judges who are competent to do this – Whitaker was one of the very few who bothered to find out what was actually meant by the reference to “tools and techniques” in the Practice Direction which he was responsible for drafting and how they, coupled with proper use of the rules, can bring down costs. I recall him saying on one of our trips together that he reckoned he had 10 years left to play his part in steering case management to where it should be. He has now lost five of those 10 years, and so have we. I have no idea what his plans are now. 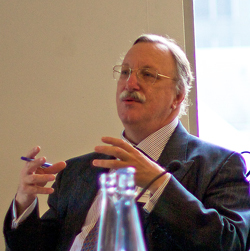 There are audiences, and not just in the UK, who are keen to receive his guidance, in the UK on the navigation of the treacherous and unpredictable post-Mitchell waters, in the US in respect of the developing (and not in a good way) prospects for cross-border for discovery, and in the civil law jurisdictions beyond. Someone should snap him up quickly as a consultant whose procedural skills and strong views come dressed in eloquence and authority. This entry was posted in Litigation Support. Bookmark the permalink. A fitting tribute to someone who has graciously and generously imparted incredible knowledge to the legal community and its clients to wonderful effect – and I sincerely hope that he continues to do so in his personal capacity, for he still quite rightly has a receptive and grateful audience. I have shared many platforms with Steven and was privileged to have been part of his working group that drafted the PD and EDQ. Throughout, I have enjoyed Steven’s knowledge, wit and company first-hand. I remember one session where we camped out on a very cold Saturday around LegalTech in my New York office, putting the finishing touches to yet another draft of the PD. I look forward to continuing to work with Steven and to further benefit from his wisdom and character.